Latvia - The Embassy of Latgale GORS is a place with a soul, where the cultural traditions of the region of Latgale combine with modern opportunities and give life to the fascinating stories of eras, people, music and art. In this place, the local dialect mixes with the sound of symphonies, and historical heritage combines with contemporary creative works. New meets old, guests encounter locals, songs hybridize with dance and art merges with cinema. The GORS cultural centre has two concert halls, a cinema, an art school, an exhibition space, a restaurant where you can enjoy the pleasure of life, and a few rooms where dance companies and orchestras may rehearse: everything has a pulsating rhythm and is full of life. A new building has been built in the park, on a bend in the river, near the "United for Latvia" monument, known among the people as "Latgales M?ra". The purpose of the building is to consolidate the performing arts and the awareness of the people of Latgale. The Embassy of Latgale GORS was opened to all culture lovers, artists and event organizers with an opening concert held in May 2013. The "Gors" Grand Concert Hall was designed for classical, acoustic and popular music concerts, theatrical performances and opera, and shows, dance performances and large-scale events. It is almost nineteen metres high and seats a thousand people. During concerts where the audience stands, it can hold as many as 3000 people. 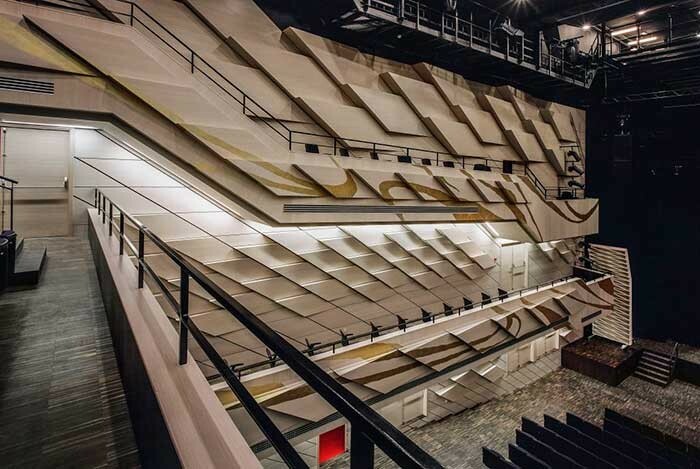 The concert hall floor is convertible so that it can change layout and function in order to meet the different needs of the various performances and shows. The managing director of SGS Sistemas Ltd, Normunds Eilands, said: "During the final concert hall building stage, the Rezekne municipal council and concert hall management decided to improve the initial design with regard to lighting technology and stage sound. Our company presented a project with several improvements and additional lighting and audio equipment. We suggested using Clay Paky moving heads for greater flexibility, owing to their excellent quality and precise light output. The fact Clay Paky offers really quiet appliances was an essential aspect in the acoustic concert hall." "Alpha Spot HPE 1500s and Alpha Wash 1500s were installed to cover the long distances, along with six Alpha Spot QWO 800 STs as moving lights. They are really light and compact. At the same time they have an excellent zoom and a light output suitable for important works. After we presented our suggestions, the Concert Hall decided to change the PA and lighting management systems completely. To date this is the first concert hall in Latvia whose lighting network has a complete backup system. The MA lighting control network offers highly flexible and reliable management options."